Is Your Email Address Hurting Your IT Job Search? If you’re ready to start working with IT recruiters to find a new IT role, you’ve probably already started doing the usual things in preparation. You’ve polished your IT resume, you’ve updated your LinkedIn profile with any new IT jobs, and you’ve started reaching out to IT staffing firms. There might be one step you’re skipping though: Creating an email address to use for your job search. Of course, not everybody needs to create a new email address before reaching out to IT recruiting agencies to start their job search. Plenty of people have email addresses that are unique and professional enough that technical recruiters wouldn’t bat an eye at them. How do you know if you need a new email address for your job search? Ask yourself these questions. Would your email address be better on a dating site? If it’s too flirty or gives information that belongs in a dating profile (you love dogs, you’re an avid skier, a single woman, etc) don’t use it. This is too distracting for IT staffing agencies and hiring managers. It’s also not the most professional way to present yourself, especially when you are presenting so little about yourself. Little things like this make a big impact. Is your email address entirely yours? Don’t give an email address you share with your spouse or partner. You also shouldn’t give an email address that has your work domain. 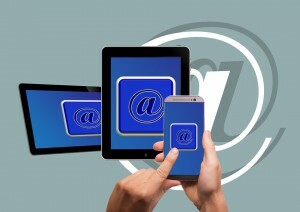 If you don’t have an email address that is entirely yours, create one! Your IT recruiting firms need to be able to easily communicate with you alone about your search. Your don’t want anybody else involved in the conversation, even if you think your spouse or company wouldn’t read these emails. Make sure your email address doesn’t trigger spam filters. Extra punctuation or characters and certain words will make it more likely that IT recruiting companies never see your emails. Don’t derail your job search for a few characters. Create a new email address and get cracking on your job search with your IT staffing companies. What does your email address say about you as an IT professional? Photo credit: Geralt via Pixabay. This entry was posted on Monday, March 14th, 2016 at 10:36 am and is filed under Advice from IT Recruiters, IT recruiting . You can follow any responses to this entry through the RSS 2.0 feed. Responses are currently closed, but you can trackback from your own site.